Take alfuzosin tablets by mouth with food and with the same meal each day. Swallow the tablets whole with a drink of water; do not crush, cut or chew the tablets. Do not take your medicine more often than directed. Do not stop taking except on your prescriber's advice. You must see your physician regularly for checkups while taking alfuzosin. Follow your physician's advice about when to have these checkups. You may feel drowsy or dizzy. Do not drive, use machinery, or do anything that requires mental alertness until you know how alfuzosin affects you. To reduce the risk of dizzy or fainting spells, do not sit or stand up quickly. If you begin to feel dizzy, sit down until you feel better. Avoid alcoholic drinks; they can make you more drowsy, increase flushing, and cause rapid heartbeats. Take alfuzosin at bedtime to lessen the effects of drowsiness and dizziness, but be careful if you have to get up during the night. Drowsiness and dizziness are more likely to occur after the first dose, after an increase in dose, or during hot weather or exercise. These effects can decrease once your body adjusts to this medicine. 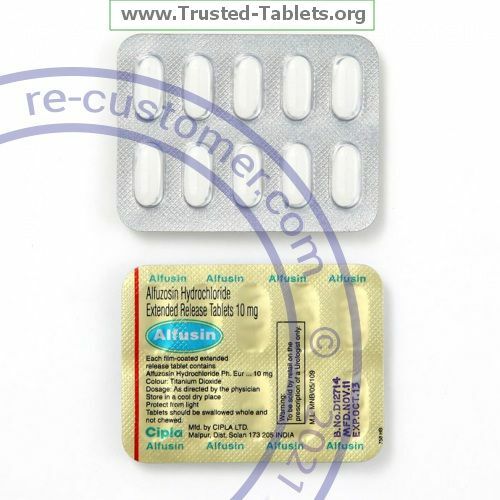 Although extremely rare in men taking alfuzosin, contact you health care provider immediately if you experience persistent painful penile erection unrelated to sexual activity (priapism). If not brought to immediate medical attention, priapism can lead to permanent erectile dysfunction (impotence). If you are going to have surgery, tell your prescriber or health care professional that you are taking alfuzosin. Store at room temperature between 15—30 ℃ (59—86 ℉). Protect from light and moisture. Throw away any unused medicine after the expiration date.